I was lucky enough to be invited to a Sally Hansen breakfast yesterday morning with a few other Melbourne bloggers to get more acquainted with the brand. At 8.05am, I made my way to Federation Square, sopping wet from the rain, to be greeted by a cheery white-and-orange tent with lovely white couches and a faux grass floor. 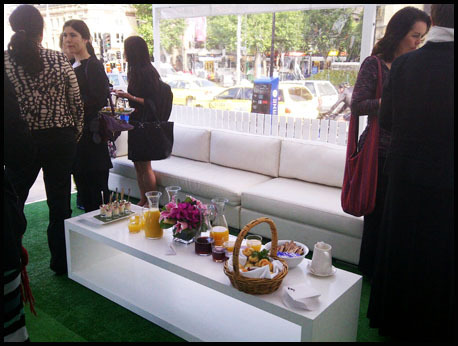 I was immediately offered some warm tea and coffee, and greeted by the gorgeous Sally Hansen PR and representatives. Despite the dreary weather, I was starting to get pretty excited! After some lovely savoury breakfast food, Sally Hansen started a little presentation. This is where I learned that Sally Hansen dominates over 50% of the nail market in the US (cue the oohs and ahhs), and that 10 bottles are sold each minute there! Sally Hansen has made a huge effort to keep with the times, introducing a salon-quality range (Complete Salon Manicure), and a quick-drying range (Insta-Dri Fast Dry Nail Color), among others. Not to mention a huge expansion of their existing colour range! They have even done collaborations with designers during Fashion Week, both in New York and in Sydney. In fact, the Sally Hansen reps tout their Complete Salon Manicure as the best, and say that you'll never want to use another brand after you've tried it! On to the manicures! I chose to get the Salon Effects range done, which are these nail polish strips that you just stick onto your nail. 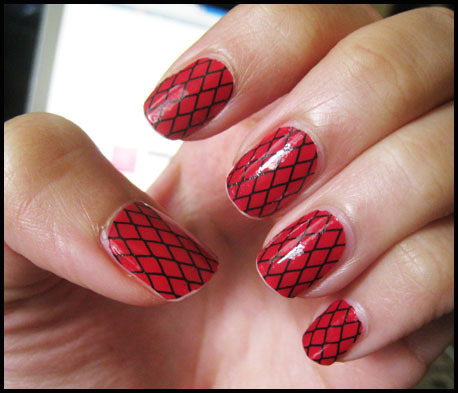 Sally Hansen are the market leader in nail polish strips, and it's not hard to see why! The Sally Hansen Salon Effects are made out of actual nail polish, so they don't peel off easily, and you can remove them with nail polish remover. It's that simple - no need for blowdrying or peeling off, which also means less damage to your nails. I chose to get something from their Halloween collection, called Wishnets. It's a lovely cherry-pink colour, with the obvious fishnet patterns running through. It looks absolutely lovely and vibrant in person. Here's a close-up of the nails one day after application. They are still new and shiny at this point, and I've experienced no peeling except for one finger, but that one probably happened because it wasn't applied well - I blame my wonky finger and the fact that I was moving about so much trying to keep warm! If you're interested in getting your manicure done for free, then head over to Federation Square! Sally Hansen are giving out manicures for free at their gorgeous (and unmissable) white-and-orange tent from 9:30am to 4pm everyday, until Thursday, November 3 2011. Try to get in before or after lunch though - those lunch crowds are a killer! This service was provided for review and consideration in accordance with this site's Disclosure Policy.